Pacers To Consider Trading Veteran Point Guard? Executives around the NBA believe that the Pacers may explore trading one of their veteran point guards before this season’s deadline, writes ESPN’s Brian Windhorst. As Windhorst outlines, while Darren Collison has been Indiana’s starting point guard over the last two seasons, he has roughly split the position with Cory Joseph — Collison has averaged 29.0 minutes per game since joining the Pacers, while Joseph has played 26.7 MPG. Both Collison and Joseph are in contract years, creating some uncertainty about whether they’ll remain in Indiana beyond this season. Meanwhile, rookie guard Aaron Holiday, who entered the team’s regular rotation when Victor Oladipo went down last month, has impressed the Pacers, and Indiana won’t necessarily want to relegate him back to the bench with Oladipo on the verge of returning. Trading either Collison or Joseph would open up minutes for the rookie. The Pacers, who currently rank fourth in the Eastern Conference with a 17-10 record, will be looking to make a playoff run this spring and won’t want to harm their short-term outlook with a trade. While Collison and Joseph may not be long-term building blocks in Indiana, they’ve been key contributors, with Collison averaging 11.6 PPG, 5.4 APG and a .479/.442/.851 shooting line over the last two seasons, while Joseph has chipped in 7.8 PPG and 3.3 APG on .433/.365/.713 shooting. Any deal would probably have to return immediate help at another position. There’s no shortage of teams in need of point guard help around the league, though it’s not clear if a trade with a rebuilding club would make the most sense. Collison or Joseph probably wouldn’t welcome a move from a top-four seed to the league-worst Suns, for instance, and even though they’ve sought a reliable point guard, the Suns likely wouldn’t give up much of value for a veteran on an expiring contract. A deal involving a playoff contender like the Sixers, Spurs, or even the Magic might be a better fit, though that’s just my speculation. A return to the NBA doesn’t appear to be in the cards for Rick Pitino, who coached the Celtics from 1997 to 2001 before spending most of the last two decades with Louisville. Having been dismissed from Louisville after the program was investigated by federal prosecutors for potential recruiting violations, Pitino writes in his new book, “Pitino: My Story,” that no NBA doors have opened lately. Asked today on Good Morning America if he wants to coach again, Pitino replied, “I don’t. It’s over for me, I know that” (video link). Veterans like Dwyane Wade, Rodney Hood, and Jamal Crawford may be the most notable free agents still available, but they’re hardly the only ones capable of helping an NBA team. Mark Deeks of GiveMeSport examines 30 unsigned players who are candidates to land on NBA rosters. In an entertaining column for The Advocate, Scott Kushner makes his case for why the NBA season should start its season on Christmas Day, pushing the playoffs deeper into the summer. Team Canada’s training camp roster for the upcoming World Cup qualifiers features a handful of NBA players, including Kelly Olynyk (Heat), Tristan Thompson (Cavaliers), Dillon Brooks (Grizzlies), Cory Joseph (Pacers), and Khem Birch (Magic). In a reversal of roles, Damian Lillard broke some news regarding Chris Haynes today, tweeting that the veteran reporter will be leaving ESPN for Yahoo, where he’ll become the Senior NBA Insider and will help build the site’s NBA team. Adrian Wojnarowski, Shams Charania, and Bobby Marks have left Yahoo within the last year and a half. Canada Basketball has announced its preliminary 18-man roster of players who have been invited to participate in training camp and exhibition play ahead of the FIBA Basketball World Cup 2019 Americas Qualifiers next month, reports Josh Lewenberg of The Sports Network. Among the 18 named individuals, eight played in the NBA last season – Khem Birch (Magic), Chris Boucher (Warriors), Dillon Brooks (Grizzlies), Cory Joseph (Pacers), Jamal Murray (Nuggets), Kelly Olynyk (Heat), Dwight Powell (Mavericks), and Tristan Thompson (Cavaliers). The preliminary roster also includes former No. 1 overall pick Anthony Bennett, as well as three other G League players – Aaron Best, Olivier Hanlan, and Kaza Kajami-Keane. The remaining six players are former first-round pick of the Magic, Andrew Nicholson, former college standouts’ Iowa State’s Melvin Ejim, Baylor’s Brady Heslip, and Gonzaga’s Kevin Pangos, as well as brothers Phil Scrubb and Tommy Scrubb. As also highlighted by Lewenberg, notable absences include Trey Lyles (Nuggets), Nik Stauskas (Nets), and most glaringly, Andrew Wiggins (Timberwolves). Per Lewenberg, multiple sources indicated that one factor in Wiggins’ decision to decline Canada Basketball’s invitation is his strained relationship with national team head coach Jay Triano, who left Wiggins on the bench during the final moments of a qualifying game for the 2016 Summer Olympics in Rio de Janeiro. MAY 4: While there has been no formal announcement from the Pacers, Joseph has officially exercised his 2018/19 option, according to RealGM’s NBA transactions log. MAY 2: Pacers guard Cory Joseph will exercise his player option to return to Indiana for one more season, reports ESPN’s Adrian Wojnarowski (via Twitter). The 2018/19 option will pay Joseph a salary of $7,945,000 before he becomes eligible for unrestricted free agency in the summer of 2019. 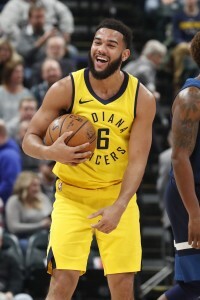 Joseph, 26, was a reliable rotation piece for the Pacers in his first season with the team, appearing in all 82 games and starting 17 when Darren Collison was unavailable. In 27.0 minutes per contest, Joseph averaged 7.9 PPG, 3.2 APG, and 3.2 RPG with a shooting line of .424/.353/.745. If Joseph had faced this year’s player option decision in either of the last two offseasons, when NBA teams had more cap room available, he likely would’ve opted out. With teams expected to spend less aggressively in free agency this summer, it’s hard to blame the veteran point guard for playing it safe and exercising that option. Joseph is already the third veteran to pick up a 2018/19 option – joining Jeremy Lin and Wesley Matthews – and he certainly won’t be the last. While Joseph’s opt-in will add more guaranteed money to the Pacers’ cap for next season, the team remains in very good financial shape, with just under $48MM in guaranteed salary on its books. If Thaddeus Young – like Joseph – picks up his player option, that would add another $13MM+ to that total. The Pacers will face decisions of their own on Collison, Bojan Bogdanovic, Lance Stephenson, Al Jefferson, and Joe Young, all of whom have team options or non-guaranteed contracts. You can follow all of this year’s player option decisions using our tracker. With the Pacers eliminated from the postseason, the focus turns to next season and how the team can improve. With several roster options to consider during the offseason, the Pacers figure to weigh the pros and cons of potentially starting both Domantas Sabonis and Myles Turner, Mark Monteith of NBA.com examines. While neither player is a finished product, both possess attributes that helped Indiana this season. Turner is a good three-point shooter and shot blocker, whereas Sabonis is the better rebounder and mid-range shooter. Although neither player is a traditional center or power forward, team president Kevin Pritchard believes that both Turner and Sabonis can help the team if they are on the floor together. Both Cory Joseph and Thaddeus Young, who have options in their contracts, could leave Indiana this offseason. However, during his end of season media session, Pritchard indicated that both men expressed interest in returning during their exit meetings, J. Michael of the Indianapolis Star writes. Since then, a report has indicated Joseph will pick up his option. Pritchard addressed several aspects of the Pacers’ season in his media session, including the team’s somewhat improbable run to the postseason, roster, and impending offseason decisions, NBA.com’s Mark Monteith writes. “In my 26 years (in the NBA) I’ve never been around a team that brought it like they did this year. They had each other’s backs,” Pritchard said. Bobby Marks of ESPN Insider (subscription required) looked at the Pacers’ impending decisions this summer. Marks examines whether Turner should be signed to a long-term deal, whether the Pacers will keep their roster together, and more. As we relayed earlier today, Cory Joseph will opt in to his contract for next year, leaving Thaddeus Young as the only Pacers player with a decision to make on a player option for next season. J. Michael of The Indianapolis Star reports that GM Kevin Pritchard indicated in exit meetings that both Joseph and Young would like to return. As it turns out, he was correct on his assessment of Joseph, and we’ll soon find out whether Young will join Joseph in exercising his player option for 2018/19 worth about $13.8MM. Michael opines that Young will likely opt out of his salary for the opportunity to sign a long-term contract, while Bobby Marks of ESPN estimates that a starting salary for Young on the open market would likely fall short of his salary for next season should he choose to opt in. Per Marks, Young will need to determine whether the future financial security of a long-term contract with a lower annual salary outweighs earning a higher salary for one season. Ultimately, Marks thinks Young will opt in, leaving the Pacers right at the salary cap come this summer. Mark Montieth of Pacers.com takes a look at the options facing Pritchard and the Pacers’ front office this offseason. The overarching question that must be answered is whether Indiana will risk their new-found positive locker room culture by bringing significant new players or leave the status quo and rely on improvement from young players such as Victor Oladipo, Myles Turner, and Domantas Sabonis. As we touched upon a couple of weeks ago, one potential free agent target for the Pacers could be Nuggets swingman Will Barton, who is an unrestricted free agent this summer.